Dexter McCluster has two punt returns for touchdowns this season for the Chiefs. KANSAS CITY, Mo. — Five issues surrounding the Chiefs right now. WELCOME BACK, DEXTER: After missing the Oakland game, Chiefs slot receiver/punt returner Dexter McCluster should be back this week. 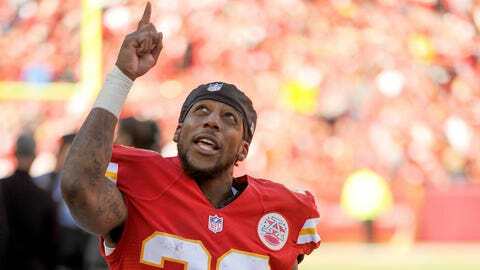 And McCluster is relieved that the infection in his foot didn’t turn out to be serious, such as the MRSA bacterial infection that has shelved other NFL players this season. McCluster got a cut on his foot during the Washington game that became infected but has since healed. "I had no idea what that was at first," he told us. "My mom was calling me and asking me what it was, (and I said) we don’t know what it is. They went in there — and thank God that it wasn’t (MRSA) — it was something that they could get in and get cleaned out and help me get back out there early." Nonetheless, McCluster, who has two punt returns for touchdowns this season, was frightened about the worst-case scenario. "I just thought, wow, something that small, a cut that I get every day in this sport, how can it be bad?" he said. "It’s very serious, I took it very seriously. I wanted to make sure it didn’t move and it didn’t spread, that it didn’t infect my body as a whole. "They did a great job going in and finding what it was and giving me the right things to take to move forward." THE MATHIS ISSUE: The Chiefs are definitely going to have their hands full trying to keep Colts superstar defensive end Robert Mathis off Alex Smith. Mathis already has 16.5 sacks to go along with six forced fumbles. Chiefs offensive coordinator Doug Pederson has been working all week on how to slow down Mathis. "I’ll tell you, he’s a tremendous player and we all know he’s playing at a high MVP-like level," Pederson said. "He’s a relentless guy. He’ll play on the left, he’ll play on the right. I mean, you have to account for him. "Teams have tried to use the back tight ends to chip, but he’ll find ways to split those double teams and sack the quarterback or create havoc in the pocket for the quarterback. Give him his respect, he’s a great player. You’re going to have to put two hands on him or four hands on him and just obviously know where he’s going to line up." Good luck. Maybe the snowy conditions at Arrowhead this Sunday will slow Mathis down. EVERYONE STEPS UP: The Chiefs grade their special-teams players on a points system and so far, coach Dave Toub reports, a different player has topped the grading chart every week. "That makes me very proud," Toub said. "We talked about this early on, that the star of our unit is the unit. That’s kind of our mantra. It’s really helped the team this year. Every week there is a different guy. "Last week it was (Husain) Abdullah. The week before, we got 21 (production) points in one game. Every week if there is a different guy that is that guy (to lead the team), just think, if everybody played a great, great game, how good we could be. I think that’s an indicator of how hard the guys are working and what we have in the room right now." down season, but they still have to prepare for him like he’s a seasoned quarterback and not just a second-year slinger. "Well, first of all, he is an exceptional talent," defensive coordinator Bob Sutton said. "We played him last year in New York (when Sutton was with the Jets), and I know after the game our players, the one thing that surprised our players the most about him was how fast he is, because he is legitimately fast. People don’t appreciate the speed. "He’s as fast as a lot of the quarterbacks that we think are really mobile and are great zone read players. He’s really strong. He’s a big man. He has a great arm. He can extend a play. He has a great understanding of the game, I think, and that appears on film. "He makes a lot of the right decisions. It’s challenging. He doesn’t have a big wind up so the break time is limited. What you have to do is you have to be in tight coverage and when he gives you an opportunity you have to be there and you have to be there for the tip. That’s kind of the way you play against these kinds of quarterbacks. You can get the ball — all of them will throw you a couple. You just have to take advantage of it when it’s there." KEEP PUSHIN’ ON: Chiefs coach Andy Reid said earlier this week that the Chiefs weren’t likely to save anything this week against the Colts, even though they may face them again in the first round of the playoffs in two weeks. Quarterback Alex Smith feels the same way, suggesting that the Chiefs can’t shift down these last two weeks of the regular season. "It’s certainly not changing my approach," Smith told us. "I think it’s a quick celebration (making the playoffs) in a sense of we’ve just opened another door. We’ve created another opportunity for ourselves and now we have a chance for the big one. Now I feel like, if anything, it all gets notched up even more. "It’s always the hot team in December and January that ends up holding that trophy. For us, it’s just about keep getting better, play good every single week, so no difference for this Sunday. Let’s go out and play our best football and continue to stay hot." You can follow Jeffrey Flanagan on Twitter @jflanagankc or email at jeffreyflanagan6@gmail.com.